When I was in Uganda, we saw a bunch of drab songbirds called cisticolas. 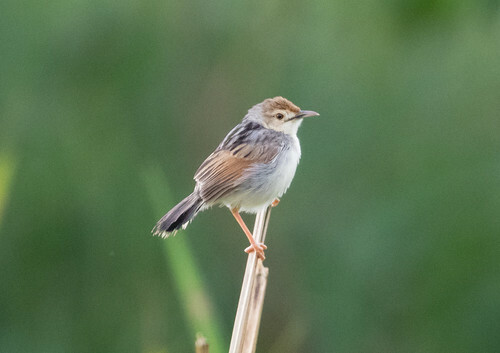 Many of the species in this group are named specifically for the sounds they make: there is a Singing, Chattering, Whistling, Trilling, Bubbling, Rattling, Tinkling, Wailing, Churring, Chirping, Croaking, Piping, Zitting, and Wing-snapping Cisticola. I’m not sure how the Winding Cisticola got its name, because it doesn’t sound like someone is winding a clock, but thinking about all those names derived from the birds’ vocalizations made me think about other birds whose names conjure sounds. The Trumpeter and Mute Swans are the two found regularly in America that are named for their sounds, or lack of sounds. When I started birding, our third swan, what we now call the Tundra Swan, was the Whistling Swan for its calls. Geese are known for their honking, but none of them are officially called honkers. Our Cackling Goose—the tiny species that other than size looks like a Canada Goose—is the only one whose name refers to its sound. And no ducks are called quackers or anything else that might conjure their calls except one group. The ones formerly called tree ducks are now called Whistling-Ducks. In North America, only one bird has “laughing” in its name: the Laughing Gull. But around the world, there’s a Laughing Dove, Owl, Kookaburra, and Falcon, and a large group called laughingthrushes. I live with an Eastern Screech-Owl who has never in the 16 years I’ve lived with him screeched. Fully 160 birds in the world have “babbler” in their name. Catbirds mew. The Barking Owl of Australia and Papua New Guinea barks, but no birds are called dogbirds. 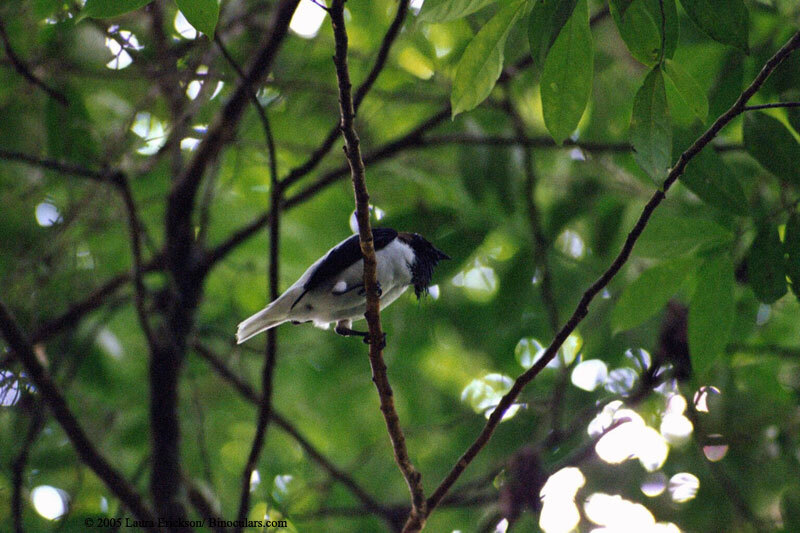 Bellbirds make a cool ringing sound—I recorded a Bearded Bellbird in Trinidad in 2001—that was the #1000 bird on my lifelist. Some bird names are obviously onomatopoeic for their vocalizations, such as the Killdeer, various cuckoos, the whip-poor-will, pewees, phoebes, and chickadees. The Bobolink’s name is ostensibly onomatopoeic, but I just can’t hear the supposed Bobolink, bobolink. Spink! Spank! Spink! To me, Bobolinks sound like R2D2. Common Loons are not named for their looney tunes. Despite the maniacal laughter that people often think makes them “looney,” our name for the loon comes from an old Scandinavian word for someone who is lame, referring to the loon’s inability to walk on land. In Great Britain, loons are called divers, and some ornithologists think we should change the American name to Great Northern Diver to match the name in the U.K. Juliet was right that “that which we call a rose by any other name would smell as sweet,” but if a group of professional botanists suddenly decided to change a rose to something else, it would certainly be confusing, as changing the name of Minnesota's state bird would. What’s in a bird’s name? It may conjure sound, or fill birders with fury, but no matter what the species, it never signifies nothing. Hi Laura - just wanted to say that I've enjoyed many of the posts on your blog and to thank you for sharing your knowledge and wisdom. I'm a Brit living in the US and I've long been curious about the extensive onomatopoeia in American bird names - I could add towhee, dickcissel and veery to your list. These names sound most peculiar to a foreigner! The only example I can think of from Britain is the rather obvious cuckoo as you mentioned (do American cuckoos really say 'cuckoo'?). Who named these birds? Can we assume that the early European settlers were so immersed in, and at one with the land and familiar with local birdsong that they nicknamed the birds accordingly and some of these just stuck? If so, how disconnected most of us have become! Regarding the loon, unless they are birdwatchers, most Britons will never have seen one and will look at you blankly if you start talking about great northern divers. They are not commonly seen. On the other hand, most Americans, and certainly all Canadians, will know what a loon is. Keep it! It's a much better name. Jill (now living in loon country). From a birder who writes, or possibly a writer who birds, thank you for this. Great article!